James Beard Award-winning Pastry Chef Dominique Ansel has shaken up the pastry world with innovation and creativity at the heart of his work. 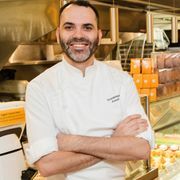 As Chef/Owner of eponymous bakeries in New York, London, and Los Angeles, as well as his first-ever restaurant which recently launched in Los Angeles, Chef Dominique has been responsible for creating some of the most fêted pastries in the world, including: the Cronut® (named one of TIME Magazine’s “25 Best inventions of 2013”), The Cookie Shot, Frozen S’more, Blossoming Hot Chocolate, and many more. Prior to opening his own shop, Dominique served as the Executive Pastry Chef for restaurant Daniel, when the team earned its coveted third Michelin star and a four-star review from the New York Times. He opened his first shop in 2011 with just four employees. As a pastry chef, baking is my way of telling a story and connecting with people. The pastries my team and I create are almost like silent film stars: They cannot speak and they do not have a voice. They are but objects on display and therefore must speak for themselves through a story—a story that is instantly recognizable and relatable. This is why, for example, our Cookie Shot has a way of bringing people back to their childhood. It reminds them of, and makes them nostalgic for, the times they enjoyed cookies with milk as children (the power of which I learned when I moved to America, since this was something I didn't do growing up in France). Or why our Frozen S'more, an ice cream adaptation of a s'more that's torched to order, makes you remember the moments when you'd toast up marshmallows around a summer campfire (also something I'd never done until I moved to New York). So when it comes to cookbooks, the ones I tend to cherish are the ones that can teach while sharing a personal narrative, creating a way to connect with the reader through the page and through the stories behind the dishes themselves. When you dive into a good cookbook, it's the stories behind the recipes that stand out to me—in which you can learn a different technique or ingredient, a different approach, a different culture. And when you take a bite of the finished dish, you understand it completely. That's how we strive to create pastries in our kitchens every day. My team and I naturally gravitated toward some of the breads and cakes in the two books, but we were also curious to try a few dishes with ingredients and techniques we weren't already familiar with. From Season, it was a classic Naan Bread, Sweet Potato Bebinca, and Elderflower Ghee Cake. And from Soul, we tested Erika Council's Black Pepper–Thyme Cornmeal Biscuits, Hoecakes, and Chicken Thighs with BBQ Beans. We made all these meals together and ate them for family meal over the course of the week. The stories in the beginning of both books were definitely considered as part of the process to understand the books' direction, but we focused mainly on the specific recipes themselves: How well they were written; if they were easy to follow; and how the overall dish turned out in the end. Here's what we thought of each recipe we made. This is a classic recipe that was quite simple to work through. A small handful of ingredients, including all-purpose flour, plain yogurt, and eggs, are combined to make a tangy enriched dough. The naan dough came together easily, and after letting it rest, we cooked it in a skillet as instructed. The finished flatbread was very fluffy, with a nice, soft texture. There's something so comforting about ripping apart warm naan, seeing that puff of steam emerge, and taking a bite. It reminds me of growing up and visiting the local bread shop for a baguette that's still warm from the oven—I can think of nothing like that very first taste. We don't typically bake with ghee, so this was an interesting choice for the team and me. We were curious to find out what the flavor and texture of the cake would be with the ghee, and how it might differ from a more traditional butter-or oil-based cake. Overall, the recipe was very easy to follow and the cake had a nice texture, though the richness in flavor that you'd typically get from standard, unclarified butter was very faint here. The addition of the elderflower cordial, brushed over the cake at the end, helped round things out. It added floral and aromatic notes and a hint of tartness, and we'd found ourselves wanting a bit more elderflower than the half cup specified in the recipe. We thought the cake tasted better on the second day, actually, as the texture was softer and elderflower liqueur soaked through to give it a bit more moisture and flavor. We had never made a bebinca before, but learned in the recipe's headnote that they are a traditional egg and coconut milk pudding from Goa. The recipe here is from Sharma's grandmother, and it includes sweet potatoes to give the dessert's custardy texture a bit more structure. Our finished bebinca had a beautiful, deep amber color from the sweet potatoes and turmeric, and was quite moist because of the six eggs in the recipe. One thing to note when you're beginning the recipe is the overall prep and cooking time. The recipe only said toward the end that we'd have to wait six hours or overnight for the bebinca to set. This would make for a nice autumn dessert. The sweetness was mild, so perhaps this could be enjoyed with ice cream, a bit of honey drizzled on top, or lightly sweetened chantilly. We picked this recipe because it seemed hearty and flavorful, and it did not disappoint—the instructions were easy to follow and produced a very well-balanced dish. Dried white beans are cooked with aromatics, chicken stock, and ingredients you'd find in BBQ sauce (brown sugar, ketchup, Worcestershire), and when the beans are cooked they are combined with seared chicken thighs. The mixture simmers and gently braises the chicken at the end. Overall, the dish had a nice kick of spice and the chicken was tender. We noticed, though, that the cooking liquid for the beans evaporated quite quickly, so we doubled the amount of liquid to keep the beans from drying out too soon. We loved the sound of this recipe, with earthy black pepper, lemony thyme, and sweet, nutty yellow cornmeal. Butter and shortening are worked into a mixture of cornmeal, flour, leavening, and salt and pepper, then this "dry" mixture is frozen for 15 minutes. After chilling, the butter/flour mixture gets mixed with buttermilk and the thyme to make a dough, then shaped and baked. When we first made the biscuits, we noticed that they came out a bit dense. We re-tested the recipe and added in some additional shortening, which resulted in much softer, fluffier biscuits. Wanting to continue working with sweet corn, we moved to hoecakes, cornbread's pan-fried cousin. The recipe here is interesting, and includes a small amount of popped corn kernels in the cornmeal batter, to add some texture. The recipe was straightforward, and these hoecakes came out nicely. They tasted pretty good with a drizzle of maple syrup and a pat of butter on top; next time, we would definitely want these served as a side dish with something heartier, like BBQ (or as croutons for a salad, as Todd suggests in the recipe), rather than just eating them on their own. 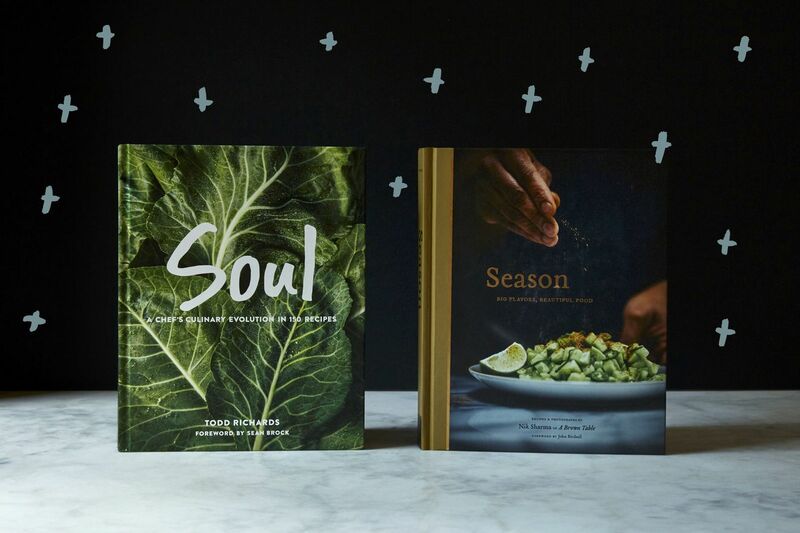 Soul is beautifully written and photographed, and there is something quite comforting and almost timeless about the recipes in it. But we found ourselves making several tweaks, and had some questions about the process at times. So, overall, for us, the winner is Season. It is a stunning compilation of foods from many different cultural influences and diverse corners of the world. The recipes are wonderful, ranging from everyday staples like naan, to dishes that we were not as familiar with, but got the chance to learn more about. Part of the fun about this project was that we were able to step outside of the box for a moment, and try our hand at new dishes and ingredients; for a team that bakes with as much butter as we do, it was interesting to work with ghee, for example, and see and taste the subtle nuances that it brings to a dish. We learned a lot from Season. The recipes in the book are thorough and clear to follow, and the end results turned out even better than we'd expected. Great review. OK love that several of the judges have enlisted a them to hele wit the reviews. I loved the way you explained how and why. Straight forward. Please Dominique, do not write about stepping outside the the box with your recipe choices. You made 5 baked good recipes and 1 recipe that was outside the box for you. Plus, you had a staff help with the completion of the judgement. You could have mixed it up a little more. Perhaps a couple of the small plates from Season. I guess when you've reached your level of success, why wander from your comfort zone? Other people have had coworkers help, where's the problem with that? We just get more feedback that way. And I don't get the impression these are his typical pastry type baking recipes, he even says so. I enjoyed getting a baker's perspective on baking recipes, and another angle on two wonderful books we have already seen several reviews for. I disagree: other reviewers have had coworkers and friends/family help, I have no problem getting even more input in a review. And these seem far from the types of pastry work he typically does (never made babinke, never baked with ghee, unused to hoecakes). I enjoyed getting a baker's review of the baking recipes in the books, another side than we have seen in other reviews of the same books. The more perspectives on these two great books the better going into finals! Sorry for the duplicate, please delete this one. Excellent review! 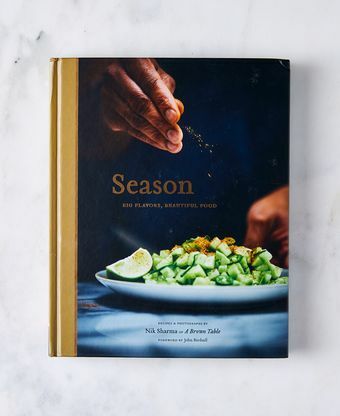 I went to the library the day I read Meg Wolitzer's review and checked out out Season, and I have so enjoyed cooking from it! My favorite cookbooks are the ones that fire up your imagination, and this one does exactly that. Nik has inspired me to play and experiment and think more deeply about the layers of flavor behind the dishes I have made for years. I can't wait to purchase my own copy, and I'm rooting for it to be the winner! This review is exactly the type I look for when I need help deciding on a cookbook...or any product, really. Well written, well researched, clear, concise, and with an obvious conclusion. Thank you!! Wonderful review, unfussy and straightforward. I like the team approach, incorporating the test dishes into staff meals. It’s interesting to observe the experience of professional cooks with books meant for home kitchens. Thank you, M. Ansel and team! Love this review! I am so happy Nik’s book is heading towards the win! 😄 I’m making that Naan tonight!! This book is the winner. Predicted it before the contest even started. I can't believe how different the recipes look when cooked and plated by professionals! A bit different to the end product in my home kitchen!! Such a great review - and excellent choice of reviewer for the semi-finals.